Artwork depicting the mythological creatures of the faerie realm has been done in different forms down through the ages in all the cultures around the globe. In ancient Greece there were many statues and relief sculptures depicting the many different dryads, hamadryads, satyrs, nymphs, gods, and goddesses. These beings represented the different aspects of nature. People in ancient times lived closer to nature, so the Gods and Godesses of nature were of great importance to them. 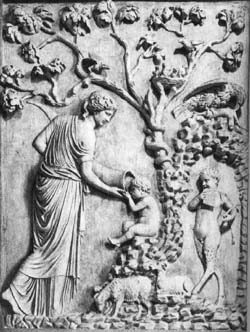 The scene to the left depicts a scene of a nymph feeding the young Dionysus while a faun looks on.